The National Geographic Diversity Award was first established in 2003. The NGDA is meant to recognize trackchasers who excel on two fronts. Points are awarded based upon a trackchaser’s state ranking in all 50 of the United States and the District of Columbia. For trackchasers to do well in this analysis they must see racing in a large number of states AND rank high in each state’s trackchasing standings. The trackchaser who has seen the most tracks of anyone in an individual state, will receive a score of “1” for that state. The second place finisher gets a “2”, third place finisher gets a “3”, etc. Anyone finishing outside of the top 10 in an individual state receives a score of 15 in that state. The National Geographic Diversity scoring scale is like golf. The low score wins. Up until 2011 there were two National Geographic Diversity awards. The first is for lifetime results. The second, now sunsetted, recorded annual results. Since 2003 was the first year of this award, both the lifetime and 2003 (annual) results were the same. During 2003, the results were limited to the top 20 worldwide trackchasers. In subsequent years, any trackchaser listed in a state’s top 10 will be eligible for the award. All results are tabulated by the National Geographic Diversity Institute located in Jackson Hole, Wyoming. Results are certified to be accurate based upon data from any credible worldwide source. Below is the table summarizing the 2017 lifetime National Geographic Diversity (NGD) results. The all-encompassing NGD competition has been going of since the 2003 trackchasing season. You can read about the background and measurement system on the home page of this post. In essence the rankings are based upon how well a trackchaser does at seeing lots of tracks in lots of American states. As you have learned the “lowest score” is a winner with the National Geographic Diversity competition. The objective is to get as many #1 rankings as you can and as few “out of the top ten” rankings as possible. If a chaser finished out of the top in a given state they are penalized for their mediocrity. They get a 15 point score in states like that. There’s no trophy for just showing up in this competition! Special congratulations are in order for first Paul Weisel. He just sneaked into 6th place in the NGD lifetime rankings by .08 points. Did you know that gaining just ONE position in ONE state will improve your score by .02 points? It takes a LOT to move up but if you are a national trackchaser but it can be done. Also congrats to Pam Smith for moving up from 10th place into a tie for ninth. There are several favorite sons in the NGD competition. These are trackchasers who grew up in a single state and have seen more tracks where they come from than anyone else. These would include: California – Randy Lewis (have lived in California now for nearly 40 years) Illinois – Randy Lewis (grew up there), Indiana – Roger Ferrell, Michigan – Allan Brown, New Jersey – Russ Currie, Ohio – Norm Wagner, Pennsylvania – Guy Smith, South Dakota – Butch Knouse, Tennessee – John Moore and Wisconsin – Ed Esser. Most of the stats come from the database created by Will White and now maintained by Guy Smith. However, other trackchasers who are not part of that database have their achievements included as well. By the way I have met each of these chasers with the exception of Norm Wagner. Below is the table summarizing the 2016 lifetime National Geographic Diversity (NGD) results. The all-encompassing NGD competition has been going of since the 2003 trackchasing season. You can read about the background and measurement system on the home page of this post. In essence the rankings are based upon how well a trackchaser does at seeing lots of tracks in lots of American states. The Lifetime National Geographic Diversity rankings measures exactly what its name implies. Just how “diverse” has a chaser’s body of work been on a national basis? It rewards those chasers who have excelled on two trackchasing fronts. Folks who have the best NGD scores have done a lot of trackchasing and they have done a lot in trackchasing in virtually every state in our great country during their trackchasing careers. There is no NGD credit given for any trackchasing activity recorded outside the U.S.
Recognizing the ‘other guys’ of trackchasing. This year I’ve been able to do something I’ve wanted to do for a long time. I have always known there are trackchasers out there who have seen many tracks in and around where they live. However, the “Pennsylvania based” trackchasing statistics have always ignored those people for one of a few reasons. Some chasers might not have ever published their trackchasing lists. Other chasers choose not to participate in the broader group. Finally, local chasers are not permitted to be listed if they have not seen a certain number of tracks. Of course, some “welfare” recipients, outside the U.S. are permitted to be recognised with 100 tracks or even less. Don’t even get me started on that! I know that several of my readers have seen lots of tracks in their home states and nearby. 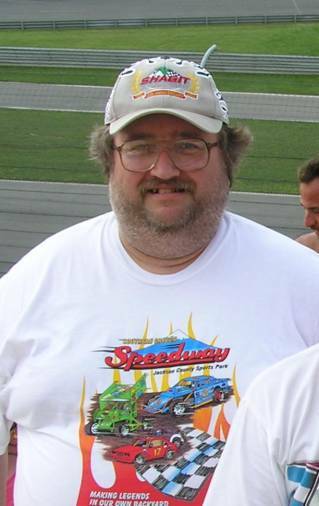 Butch Knouse of Cavour, South Dakota has seen racing at nineteen SD tracks. John Sullivan of Orrington, Maine has seen 15 tracks in his home state. Mark Virt, new to the list in 2012, has seen 17 tracks in Arizona. Every one of these “unknown” trackchasers ranks in the top 4 or better in their home state. Butch Knouse from South Dakota has seen more tracks than anyone else in the Mount Rushmore state. John gets a #2 rating in the Maniac state. Mark Virt comes in at #4 in the Grand Canyon state. As time passes I suspect others will come forward with their results that have been ignored up to now. There are several highlights with this years’ NGD results. Take a look at these NGD facts. These trackchasers lead in their home states. It takes 112 tracks to get a tenth place ranking in Pennsylvania. On the other hand a chaser can get a #1 ranking with just three tracks in Rhode Island or five tracks in Hawaii. Only thirteen trackchasers have come to Alaska to see racing. Carol and I have 18 track visits in the Last Frontier state. Below is the ranking by state of each trackchaser who has ever gained a top 10 state finish, since the NGD program began in 2003. ** There’s an incredible amount of data to sort through here. The trackchasing information is available on several public websites. As an example, all of my personal results are posted on my website at www.randylewis.org. Other results come from www.roamingtheraceways.com. And for the first time ever results from individual trackchasers who have been “off the grid” are now included. Recognising the ‘other guys’ of trackchasing. This year I’ve been able to do something I’ve wanted to do for a long time. I have long known there are trackchasers out there who have seen many tracks in and around where they live. However, the “official” trackchasing statistics have always ignored those people for one of a few reasons. Some chasers might not have ever submitted their trackchasing lists. Other chasers choose not to participate in the broader group. Finally, local chasers are not permitted to be listed if they have not seen at least 200 total tracks. Of course, some “welfare” recipients, outside the U.S. are permitted to be listed with 100 tracks or even less. Don’t even get me started on that! Welcome Butch and John…and more to come. I know that several of my readers have seen lots of tracks in their home states and nearby. Butch Knouse of Cavour, South Dakota has seen racing at nineteen SD tracks. John Sullivan of Orrington, Maine has seen 15 tracks in his home state. Heretofore, these trackchasing results would have been overlooked. Not any more. This year, I am including the results for Butch and John and anyone else that I find out about regardless of how many total tracks they have seen in total. Butch’s South Dakota results give him a #1 rating in the Mount Rushmore state. John gets a #2 rating in the Maniac state. As time passes I suspect others will come forward with their results that have been ignored up to now. Several trackchasers lead in their home states. It takes 112 tracks to get a tenth place ranking in Pennsylvania. On the other hand a chaser can get a #1 ranking with just three tracks in Rhode Island or four tracks in Hawaii. Pam Smith has moved into a tie with Pat Eckel for the #1 woman in the rankings. They each share a 12.65 NGD rating. Ed Esser (lifetime rank #3 – up from #4), Gordon Killian (lifetime rank #2) and Mike Knappenberger (lifetime rank #13 – up from #18) showed the biggest year over year improvements in their NGD score. Ed went from 8.55 to 7.98. Gordon moved from 6.49 to 6.00. Mike’s scored declined from 12.73 to 12.29. Remember a declining score is a good score. These guys never give up although maybe they should. With Gordon’s improvement I will once again have to put some focus toward maintaining my #1 rating. You will likely see me trackchasing more often in states where I can move up in the comparisons. ** There’s an incredible amount of data to sort through here. The trackchasing information is available on several public websites. As an example, all of my personal results are posted on my website at www.randylewis.org. Other results come from www.roamingtheraceways.com. And for the first time ever results from individual trackchasers who have been “off the grid” are now included. If anyone would like to challenge the accuracy of any of the data, I will accept successful challenges through April 30, 2012. After that date, all results are final. We’ll see you all here about this time next year. At that time, we’ll know how trackchasers have done in the prestigious National Geographic Diversity rankings with another year under the contest’s belt. Individual state rankings for the season are available by emailing the NGD Institute at ranlay@yahoo.com. You can view a snapshot of the complete lifetime National Geographic Diversity Results by clicking on the link below. You will see each chasers rank by state as well as their overall lifetime NGD total score. It’s that time of year again. Yes, it’s time to recognize those trackchasers who excel at seeing racing in two important trackchasing categories. I’m talking about trackchasers who see a large number of tracks in a particular state and those that see racing in a large number of states. Which do you think is the more noteworthy trackchasing accomplishment, seeing 100 tracks in one state or two tracks in each of the fifty states? The answer to that question could be debated until the “cows come home”. That’s why the National Geographic Diversity (NGD) rankings were created all the way back in 2003. We’ve had two extremes in trackchasing. First, we have the “regional” trackchaser who has seen very large numbers of tracks in just a few states. Typically, these chasers have miniscule totals in the states located beyond their regions. On the other hand, we have trackchasers who have managed to see racing in all fifty states or nearly all states but have not seen very many tracks in most of those states. The National Geographic Diversity program seeks to identify those trackchasers who have seen “lots of tracks in lots of states”. The program does not reward the regional trackchaser or the trackchaser who has only dipped his/her trackchasing proverbial toe in each state. The National Geographic Diversity rankings measures exactly what its name implies. Just how “Diverse” has a chaser’s body of work been on a national basis. It rewards those chasers who have done a lot of trackchasing all over the country. I can’t think of a more significant accomplishment within the United States. The NGD “marries up” the concept of seeing a lot of tracks with seeing a lot of tracks in several states. Briefly, here is how it works. If a trackchaser holds a rank of number one in an individual state he/she gets 1 NGD point. A second place ranking gives two points, etc. etc. through position number ten. This is scoring system is used for all fifty states and the District of Columbia. At the end of the year, the trackchaser with the lowest score wins, just like how Tiger Woods does it in golf…..sort of. In most states, some 20-50 trackchasers have seen at least one track. Some states are much more “competitive” than others. In some states several chasers have seen more than 100 tracks. In some states, like New Mexico, only a few trackchasers have ever been there. This state is so isolated from a trackchasing point of view, that only one trackchaser has seen more than six tracks in the Aztec state. When the NGD contest was formalized the concept of “penalty” points was developed. Yes, the penalty points would be assigned to those underachievers (ne’er-do-wells?) who couldn’t achieve at least a “top ten” ranking in an individual state. Every trackchaser who ranks outside the top ten gets an NGD score of fifteen in that state. The penalty points have really kept me from doing better in this contest. I have consistently had 10-15 states where I had a ranking worse than tenth. The trackchasers really get a kick out of my publishing the NGD results. Even those who quibble about the rules, always check out their ranking when it’s posted once a year. The quote below is a good summary of how to look at the National Geographic Diversity rankings. This came from one of our Eastern based top 10 chasers. I really couldn’t have described the situation any better. However, I must provide further comment about a “demented individual” having devised this system. Although I formalized the concept I remember getting input on the general concept from Andy Ritter, Guy Smith and Will White among others all the way back in 2002. In this report I will publish the lifetime NGD results. In a future domestic Trackchaser Report, I’ll share the 2010 only results. Of course, the results will be posted at www.randylewis.org as well. This year there were only minor changes throughout the lifetime NGD list. One notable exception was seeing Orefield, Pennsylvania’s Paul Weisel move into the top ten. There are always some trackchasers improving their NGD score and others moving south. Ed Esser improved his score and is just about ready to overtake Allan Brown for third place. Pam Smith and Mike Knappenberger are others in the top 20 that continue to improve their scores and ranking. Pat Eckel still holds down the #1 spot in the women’s category. Below is the list of past lifetime NGD champions and their winning scores. I’ve only held the top spot once during the NGD’s seven-year existence. Nevertheless, for years, I have said this is the most coveted trackchasing title outside of having seen the most tracks on a worldwide basis. I still feel that way. As you can see the scores have been getting lower and lower for the champions as the years roll past. This is one of the most competitive categories in all of trackchasing. Trackchasers, including but not limited to me, have been known to plan their entire trackchasing schedule around the areas where the most NGD points could be added. This is a VERY competitive area of our hobby. 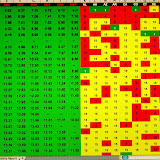 All data is based upon results posted at www.autoracingrecords.com through February 28, 2011. Any results posted after that will not count. Any questions? Sorry, no questions allowed. Here are the lifetime National Geographic Diversity results for the period ending December 31, 2010. ** There’s an incredible amount of data to sort through here. As an example, all of my personal trackchasing visits are posted on my website at www.randylewis.org. Trackchasing commissioner Will White first goes to my website to get my results to post on his website at www.autoracingrecords.com. Contrary to deeply held beliefs, I do not charge him for the use of this data. He gets other’s results from various sources. I then go to Will’s site to get the data that, once massaged, becomes the official lifetime NGD results. If anyone would like to challenge the accuracy of any of the data, I will accept successful challenges through March 31, 2011. After that date, all results are final. We have a new lifetime National Geographic Diversity winner for 2009. For just the second time ever Randy Lewis from San Clemente, California is the lifetime NGD winner. He also won in 2007. This year his record breaking lifetime score of 5.29 was good enough for the victory. Randy improved his score dramatically by moving into the top ten in Connecticut, Maine, New Hampshire and Vermont. Last year’s champion, and four-time winner Gordon Killian of Sinking Springs, Pennsylvania was bumped down into second place with a score of 6.29 up from his winning tally of 5.96 last year. The newest addition to the top ten was Robert Helmick of Orlando, Florida. Robert first began reporting his tracks this year. His move into sixth place in the lifetime NGD results included moving several trackchasers down a spot in more than half of the U.S. The trackchasers really get a kick out of these NGD results being publishing. Even those who quibble about the rules, always check out their ranking when it’s posted once a year. The quote below is a good summary of how to look at the National Geographic Diversity rankings. This came from one of our Eastern based top 15 chasers. As you can see from reading below, the scores have been getting lower and lower for the champions as the years roll past. This is one of the most competitive categories in all of trackchasing. Trackchasers have been known to plan their entire trackchasing schedule around the areas where the most NGD points could be added. This is a VERY competitive area of our hobby. There were a number of significant changes in this year’s lifetime standings. First, Mr. Helmick’s initial appearance on the scene moved him into sixth place overall. I didn’t notice it throughout the year but Paul Weisel was on the move. He improved his year-to-year lifetime score from 12.75 to 11.80. That dramatic improvement moved him up from 18th place last year to 11th place this year. It is not often that someone can move up this much this fast. The scores throughout the pack didn’t change much. Some chasers are dropping a spot or two as they cut back on their participation in the hobby. Nancy Brown had the top women’s score at 12.57. Closely behind her were both Pat Eckel and San Clemente’s own Carol Lewis at 12.63. To show how tight the results were there were less than two points separating Paul Weisel in 11th place (11.80) and Kevin Eckert in 28th place (13.75). By the way, just ONE POSITION IN ONE STATE equates to .02 points. You can see just how close some of these contests were. The NGD lifetime leader may hold the most presitigious position in all of trackchasing, at least in the United States. This leadership position signifies a dominance in BOTH states visited and tracks seen within all of those states. Special congratulations go out to John Moore, Guy Smith, Pam Smith, Randy Lewis, Ed Esser, Gary Jacob, Allan Brown, Pappy Hough, Roger Ferrell, Rick Schneider, Jack Erdmann, Gordon Killian, Robert Helmick, Pam Smith, Chris Economaki, Brian Hickey, Paul Weidman, and Norm Wagner. They all led the lifetime state standings in one state or more. The standings below show the lifetime scores since the contest began in 2003. You can see who is going “backward” and who is “coming on.” As mentioned, each position in each state equates to .02 points in the lifetime NGD score. For the fourth time in six years Gordon Killian leads the lifetime National Geographic Diversity standings. Gordon’s score of 5.96 leads the pack. Randy Lewis (last year’s champion) finished up in second place with a score of 6.02. Both scores were record lows never seen before in NGD’s history dating back to 2003. Gordon achieved his record score without a single first place finish in any of the 50 states or District of Columbia. However, he had just three finishes outside of the top ten in any of the 51 states/districts. Randy took another groove in the lifetime NGD results. He recorded first place rankings in 13 different states. However, his out of the top ten finishes occurred in 12 different states relegating him to a second place finish. In the women’s division, Pat Eckel edged past Nancy Brown winning her second women’s division championship with a score of 12.27 (13th rank overall) to Nancy’s 12.37. These two have exchanged the champion’s trophy annually for past few years. Carol Lewis finished on the lead lap with a score of 12.67. For the first time in the five year history of the National Geographic Diversity championships, we have a winner who comes from west of the Mississippi. Randy Lewis of San Clemente, California is the new lifetime leader with a record score of 6.37. In one of the most hard fought battles in the history of trackchasing Randy defeated Gordon Killian of Sinking Spring, Pennsylvania. Mr. Killian’s score of 6.59 also beat all previous NGD scores achieved to date. Randy’s eleven first place state finishes, 22 top threes and 33 top fives helped overcome 12 worst than 10th place finishes on the way to victory. In the women’s division, Nancy Brown edged past Pat Eckel winning her second women’s division championship with a score of 12.16 (14th rank overall) to Pat’s 12.63. Carol Lewis and Pam Smith finished on the lead lap with scores of 12.86 and 12.96 respectively. For the third consecutive year, Gordon Killian is the lifetime leader of the National Geographic Diversity championships. Mr. Killian of Sinking Spring, Pennsylvania achieved a NGD score of 7.08. He defeated Randy Lewis (7.16) in an even closer finish than his victory over Allan Brown in 2004. In the women’s division, Pat Eckel nudged ahead of repeat winner Nancy Brown with a 12.18 score (14th rank overall). She defeated Nancy by just .02 points. By the way, just ONE POSITION IN ONE STATE equates to .02 points. That means when all the results are totaled for 50 states and the District of Columbia, New Jersey’s Pat Eckel is better than Nancy in just one state by one position. That’s close! Surprisingly, Mr. Killian did not lead the state standings anywhere. On the other hand, Mr. Lewis was the state leader in only two states. Leading the lifetime NGD standings is not about being the leader in a handful of states in and around a trackchaser’s home location. The NGD lifetime leader may hold the most prestigious position in all of trackchasing, at least in the United States. This leadership position signifies a dominance in BOTH states visited and tracks seen within all of those states. Mr. Killian had only 8 states where he did not rank in the lifetime top 10. On the other hand, Mr. Lewis has 10 where he receives the maximum 15 NGD points for not ranking in a state’s top 10. Just like golf, it’s not how many birdies you make, but how many double bogeys you avoid that really affects your score. Special congratulations go out to John Moore, Guy Smith, Randy Lewis, Ed Esser, Gary Jacob, Allan Brown, Pappy Hough, Roger Ferrell, Rick Schneider, Jack Erdmann, Paul Weidman, Alan Skinrood, Norm Wagner and Andy Ritter. They all led the lifetime state standings in one state or more. The standings below show the lifetime scores since the contest began in 2003. You can see who is going “backward” and who is “coming on.” As mentioned, each position in each state equates to .02 points in the lifetime NGD score. Mr. Lewis is only four total positions behind Mr. Killian. He began the 2006 season some 36 positions in arrears. Will we see a change in leadership for the Lifetime NGD Leader in the coming year? Only time will tell. For the second consecutive year, Gordon Killian is the lifetime leader of the National Geographic Diversity championships. Mr. Killian of Sinking Spring, Pennsylvaniaachieved a NGD score of 7.41. He defeated Allan Brown (7.53) in the closest battle in the history of the NGD. In the women’s division Nancy Brown took lifetime honors with a 11.84 score (15th rank overall). She barely outdistanced New Jersey’s Pat Eckel who currently has a NGD score of 11.90. Surprisingly, Mr. Killian did not lead the state standings anywhere. On the other hand, Mr. Brown was the state leader in Colorado, Idaho, Kansas, Michigan, Montana, Washington and Wyoming! How did Mr. Killian still manage to defeat Michigan’s Mr. Brown? Mr. Killian had only 10 states where he did not rank in the lifetime top 10. On the other hand, Mr. Brown has 14 states where he receives 15 NGD points for not ranking in a state’s top 10. Just like golf, it’s not how many birdies you make, but how many double bogeys you avoid that really affects your score. Special congratulations go out to Alan Skinrood, Eleanor Weidman, Paul Weidman, Pam Smith, Gary Jacob, Roger Ferrell, Norm Wagner, Pappy Hough, P.J. Hollebrand, Jack Erdmann, John Moore, Guy Smith, Ed Esser, Rick Schneider, Andy Sivi and Randy Lewis. They all led the lifetime state standings in one state or more. In a dramatic reversal, reminiscent of the presidential elections, Gordon Killian has taken over the lifetime leadership position in the National Geographic Diversity category. Mr. Killian of Sinking Spring, Pennsylvaniaachieved a NGD score of 6.78 to best last year’s leader Allan Brown by 0.18 points. Mr. Killian used consistency to achieve his number one position. While he did not lead a single state in number of lifetime tracks attended, he finished out of the top 10 in only five states (AL, GA, IN, LA, NM). Mr. Killian had a top six or better finish in 27 states. Mr. Brown did better in both states with the most tracks (9-CO, KS, MI, MT, NE, OR, WA, WY) and top six finishes with 34. His Achilles heal was finishes out of the top 10 where competitors are saddled with a 15 point NGD score. Mr. Brown had 14 states (AZ, CT, DE, ME, MD, MA, NH, NJ, NY, PA, SC, VT, VA, WV) where he did not garner a top 10 finish. As you can see the East Coast did him in, but second place is not a bad position in the National Geographic Diversity standings. This is Mr. Killian’s first time on top of the NGD rankings. He will maintain his #1 world ranking until the completion of the 2005 season. We will see if Mr. Brown has anything for our new champion during this coming year. Congratulations to Mr. Killian on both the quantity of states he has seen tracks in as well as his track penetration in the United States. In 2003, Allan Brown of Comstock Park, Michigan was the inaugural winner of the NGDA with a score of 6.80. Mr. Brown is the publisher of the National Speedway Directory and travels all over the country selling his book. His travels allow his to rank high in the lifetime rankings for the National Geographic Diversity Award. He was able to lead the pack by having a fair number of first place state finishes (7) with a relatively few number of out of the top 10 finishes (15). Fellow trackchasers Gordon Killian, Sinking Sprint, Pennsylvania and Rick Schneider, Bay Shore,New York, finished up in second and third positions for 2003. Mr. Killian did not rank first in any states but had a group low of out of the top 10 finishes of just seven. Guy Smith, Effort,Pennsylvania and John Moore, noxville, Tennessee had the highest number of first place finishes with 11 each. Although it may be difficult to unseat Allan in the lifetime standings, any trackchaser can do well in the annual standings.